Libya’s oil fields and infrastructure have come under attack multiple times over much of the last two years, but events have recently taken a turn for the worse. Libya’s National Oil Corporation (NOC) reported that a pipeline explosion on February 14 disrupted flows from a major oil field, threatening to further knock crude output offline in the war-torn country. The pipeline connects the El Sarir field, Libya’s largest producing oil field at 200,000 barrels per day, to the Hariga terminal on the Mediterranean coast. Exports can reportedly continue as there are significant volumes of oil stored on site at the Hariga port. But production has been severely curtailed. That was not the only attack in recent days. Gunmen seized government buildings in Sirte, taking control of radio and television stations and forcing out government officials. A separate attack on the Bahi oil facility on February 13 failed to cause substantial damage. That field is operated by a joint venture made up of ConocoPhillips, Hess Corporation, and Marathon Oil Corporation. Related: What’s Next For OPEC? The pipeline attack led to a reduction in Libya’s oil production by about 180,000 barrels per day, likely bringing total production across the country to under 200,000 barrels per day. That is close to the lowest production rate in recent memory and is significantly down from the 1.6 million barrels per day that Libya produced before the civil war and overthrow of former leader Muammar Qadhafi. The fighting has grown more complex as some fighters have claimed ties to the Islamic State in Iraq and Syria. The Islamic State is reportedly creating its own government institutions in the city of Derna. Libya Dawn, a group of militant factions which includes Islamic extremists, had already captured control of Tripoli last year, forcing the internationally-recognized government to flee the city. Meanwhile, an army led by General Khalifa Haftar has taken control of much of Libya’s east, and is vowing to cleanse the country of terrorists, as chronicled in a sweeping article in The New Yorker. The spiral of violence shows no indication of letting up, suggesting things could get much worse before they get better. That lowers the chances that Libya will be able to turn its oil fortunes around. 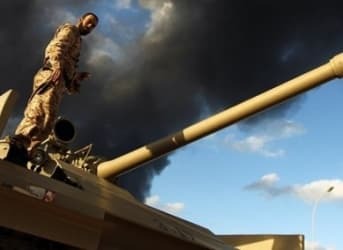 Oil accounts for around 90 percent of Libya’s budget revenues, meaning that the current low prices along with crumbling levels of production are hurling the country towards economic crisis, on top of the worsening security crisis. So far the oil markets have ignored low levels of production in Libya – prices crashed over the previous seven months or so even though Libya has seen repeated bouts of violence. Now, the situation has worsened to such an extent that the markets are starting to take notice. Brent prices traded up to $62 per barrel on February 16, in part due to the recent pipeline explosion and Egyptian air strikes.